The Knot reports that bridal couples are pulling out all the stops to make sure their loved ones have an absolute blast: The average couple hosts 136 guests, and the average spent per guest is $258. Besides the expected food, drink and music, 38% of couples hire above-and-beyond reception entertainment. The Knot’s survey respondents listed live tattoo artists, cigar-rolling stations and craft margarita bars among the outside-the-box attractions. The cost of an average wedding (not including the honeymoon) reached another all-time high in 2018. The total expenditure of $33,931 was up slightly from 2017’s mark of $33,391. The engagement ring — at $5,680 — remained the second-highest-priced item on the list of all wedding expenses (the venue was #1). The average price for an engagement ring in 2018 was slightly down from the previous year’s total of $5,764. The Knot noted, however, that a sub-group of “high spenders” (those whose weddings cost more than $60,000) spent an average of $13,619 on their engagement rings. While couples embrace, reclaim and redefine some traditions, they’re breaking with others, such as the garter toss (33%, down from 41% in 2016), and the bouquet toss (45%, down from 53% in 2016). 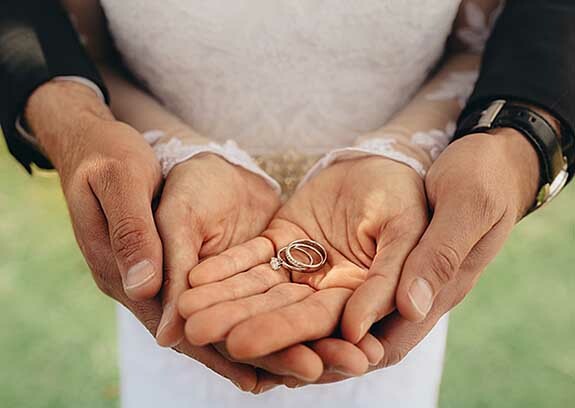 The 2018 “Real Weddings Study” is based on the responses from nearly 14,000 U.S. brides and grooms married between January 1 and December 31, 2018.